Bangladesh Tax Commission is one of the high ranked government offices in Bangladesh. Every year a number of people apply for the job keeping a dream of getting a job here. Recently the Tax Commission has published a job circular in which it said that a few people will be recruited under different categories. Tax Commissioner Office job circular was published on December 12 and all the needed information has been given here. We have uploaded the job circular in our website so that you can go through. 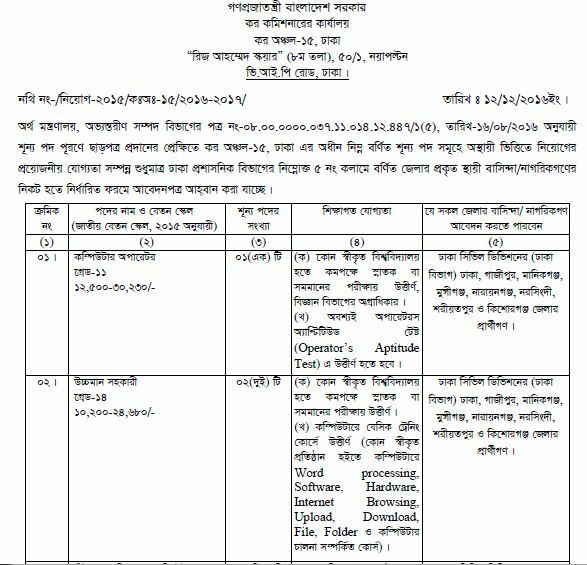 More details of Tax Commissioner Office job circular has been updated in the later part of the news. Applicants need to fill up the application form manually and it will be found in www.taxeszone15.com. The form need to be sent to Tax Commission office by January 15, 2017. All needed documents including educational certificates and passport site photographs are have to be sent with the application. A ten taka postal ticket need to be used to send the application. Age limit is18 to 30 for the job while candidates having freedom fighter’s link will be given the age limit up to 32. No TA/DA will be provided during the job exams. To get Tax Commissioner Office job result 2016-17 and all the updates of it, please stay connected with us.